BluePath is gearing up for its third annual walkathon fundraiser, to be held on Saturday, May 18 at FDR State Park in Yorktown Heights. The event raises funds in support of BluePath's mission to provide autism service dogs, offering safety, companionship and opportunities for independence. The family-friendly fundraiser, held from 10:00am to 2:00pm, is open to all ages and begins in Lot 4 of FDR State Park. Walkers can choose between a 1.7 mile or 3-mile loop. Kids will be entertained with a variety of activities including a bouncy house, lawn games, face painting and costumed characters. Friendly dogs are welcome on leashes 6' or shorter. According to the Center for Disease Control, more than 3.5 million Americans live with an autism spectrum disorder. It is the fastest growing developmental disability in the United States, with 1 in 59 children receiving a diagnosis. BluePath dogs and ongoing professional follow up support are provided free of charge, ensuring that finances are not a barrier to receiving a life-changing service dog. BluePath dogs significantly reduce parents’ safety concerns and help children to lead fuller lives. Reduced stress, improved sleeping routines, and more meaningful social interactions can allow families to feel a renewed sense of hope and empowerment. Nancy Hughes recently received BluePath service dog Benni for her son, Matthew. Matthew is highly impacted by autism and was prone to bolting into dangerous situations. 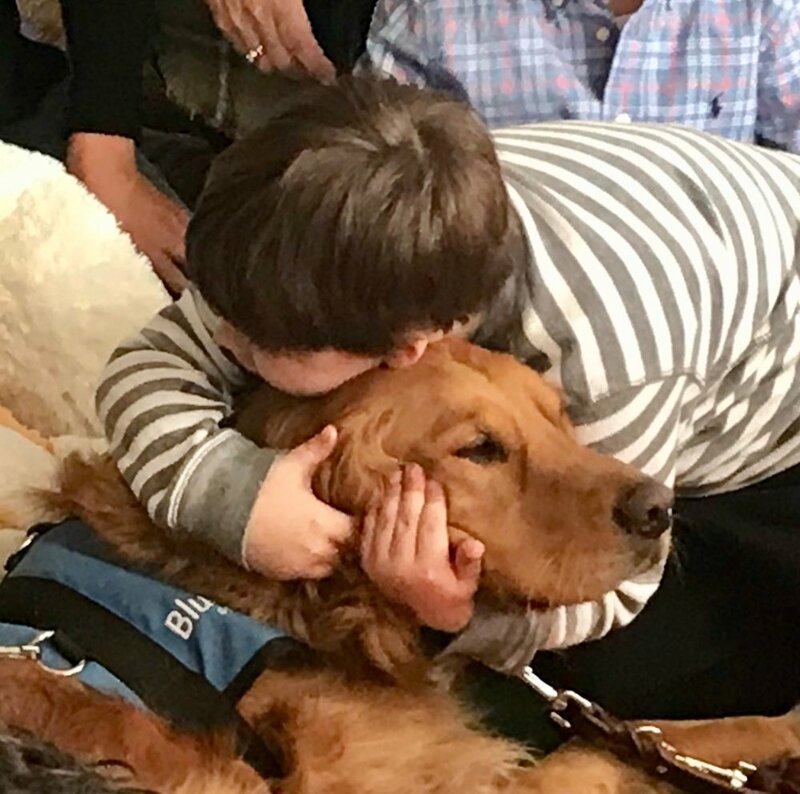 Life without a service dog was becoming increasingly difficult, often meaning the family had to adopt a “divide and conquer” strategy or miss out on community activities. Walkathon registration includes a BluePath event t-shirt. Adult walkers are $30; children under 13 years old are $20. Visit www.bluepathservicedogs.org/walkathon to learn more or register. Those unable to participate on May 18 also have the option to support walkers with an online donation or become a virtual walker with a personalized fundraising page. Sponsorship opportunities are still available; for more information, contact Erica Stanzione at 914-804-4023 or erica.stanzione@bluepathservicedogs.org. About BluePath Service Dogs, Inc.
Our work at Springhurst Elementary is featured in the Rivertown News this week! The Kids and Canines Learning Together Program enables teachers to incorporate dogs into the curriculum, allowing students to learn while also feeling pride and accomplishment as dogs progress through training. Our dogs receive training with a variety of children while helping to regulate behavior and prevent meltdowns. The interactions also facilitate invaluable awareness and understanding. Future service dog Lakota receives a hug from a student at Springhurst Elementary School. Assistance Dogs: What's the Difference? We are staunch advocates for the rights of people with disabilities. We’ve seen firsthand, countless times, how the right resources can help individuals triumph over adversity and achieve their dreams. It is in this lens that we present this educational infographic, which explains the different ways dogs help people and why some dogs are entitled to public access. Please read and share - and reach out to us anytime if you have questions. 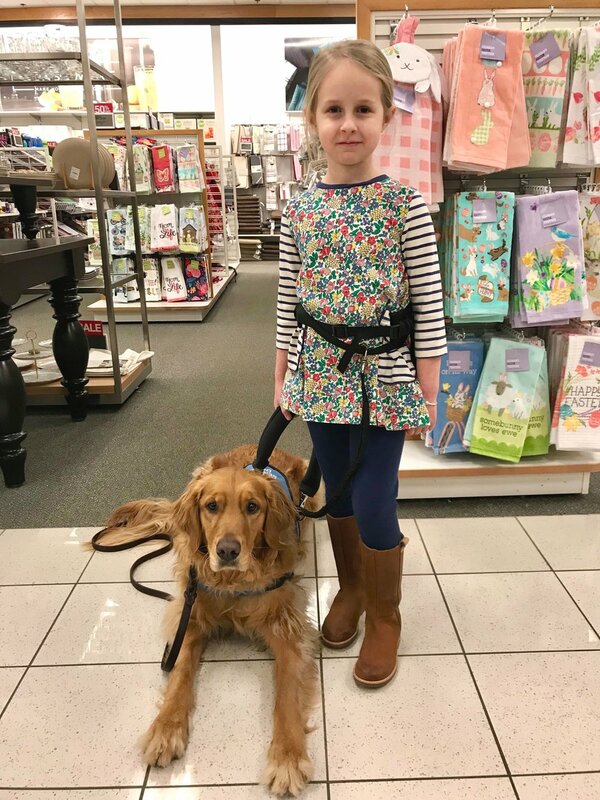 BluePath dogs keep children safe through a specially designed belt and tether system that connects to the dog’s service vest. When a child bolts, the dog “anchors,” effectively stopping the child from a potentially dangerous situation. Autism’s sensory issues can involve sensitivity to a wide range of stimuli. Some clothing and accessories can cause children to become anxious or overwhelmed if the fit is uncomfortable. When choosing our own equipment, it was extremely important for our belt to be lightweight and adjustable for size and pressure preferences. We’re grateful to Craig Larsen of Larz Dog Products for taking the time to learn about our mission and the clients we serve. After speaking with autism parents and BluePath training staff, Craig developed the perfect belt and tether system to support our work. While Craig is now retired, our recent equipment order will last us for many years to come. Craig, thank you for your kindness to us, and for your willingness to go above and beyond to help families with children with autism. Volunteer Lilah wears a Larz belt during a training route with BluePath Lakota. It is the anniversary of the night before you arrived; January 9, 2018. Like any expectant puppy parent, I was excited, nervous and anxious. I had been down this road before. I couldn’t wait for your puppy breath to hit me in the face or to cuddle with you as you would sleep on my lap. I also knew I may be seeing my last good night’s sleep for a while, but I didn’t care. You were arriving. You had been born in NC, transported lovingly by numerous volunteers and I was being handed your care for the next year. You were born for special work, but in that moment, your work was just about puppyhood and I was ready. As I expected, you came into my life and stole my heart. I took you with me when I could, when I knew it would be appropriate and I knew you could learn and grow from our outing. Oh, the smiles you brought and connections you made. From our trips just around the neighborhood, slowly but surely, we would stop, greet, meet and tell your story. You were Izzy, a pup born for a very specific reason, but for right now, puppyhood was your most important work. My mom loved your visits. You had no idea, but as a stroke victim, you filled up her otherwise quiet days. She was so proud to introduce you. We both were proud as you demonstrated sit, down, come, and later heel and would even give paw. You were the best entertainment to both her and others in the long-term care unit. You quickly grew into your “puppy in training” jacket and you wore it so proudly. Like a little kid who quickly changes behavior when donning dress clothes for a fancy occasion, you seemed to recognize the importance of that jacket and every adventure we took. From visits to the local coffee shop where we practiced patience and settle, to entering and exiting each door, to the mall where we worked to avoid the gum or crumb you would encounter here and there on the floor, you consistently rose to the challenge. “Those eyes,” I would often hear remarked. As you worked, you would check in, always waiting for a reward for your effort, but also connecting with me as your handler. Though we did our work every day, the play we have had brings some of the sweetest memories. You quickly showed us your love of water and I took advantage of my love for it too. Our first time loading into a kayak, I wasn’t sure about a lab’s ability to stay in a boat, but you settled down and enjoyed that paddle as much as I did. When given the chance, you took advantage of wading and swimming. The long summer days and our proximity to a lake brought us both a lot of joy, not to mention all of those “firsts” I watched you experience as you played in the sand, surf and found every stick you could unearth. Over the last year, you have become my buddy. In the mornings when I stretch or do a little yoga, you are my sidekick, rolling onto your back and ready for a belly rub while my intent was to reach for my toes. You have become my fitness trainer, always ready to go out for our 2-3-mile walk, no matter the weather or day of the week. As you get ready for your next adventure, I reflect on how much you have learned. And, of course, how much I have learned and experienced because of you. You are now ready with all your basic household skills and so many life experiences too. The sounds, smells, people, places we’ve traveled, car rides...what a joyful puppyhood it has been. And on the eve of the anniversary of your arrival, I’m reminded that our time together, your puppyhood, is ending soon too. Izzy, you are ready to explore your potential, to work one on one with a professional trainer who will explore your ability to change another life, to give independence where there perhaps was little. Thanks for allowing me to be part your journey. To every puppy raiser, ever, the selfless act of raising a puppy for another person is one of pure and innocent kindness. Lyons’ raisers are here today. And we thank you; you represent all raisers. Your hands, your voice, your love, your grit, your determination, your tears and your laughter are now captured forever in the heart of the dog you so lovingly raised. Thank you. To all of our supporters, BluePath would still be in the infant stage without you. You are a critical and radiant component to our journey forward. Thank you for taking that leap of faith with us, so quickly and so confidently, that we find ourselves, less than two years old, graduating our first class. Your words of encouragement have been especially important. They are the fuel to our fire as we forge forward entering realms we have never tackled before. Thank you. Board members, you continue to push us and never let us limit ourselves. When we reach the stars, you will be there to tell us to go higher. Thank you. Guide Dog Foundation, you called to say you have an adult dog whose temperament might be a better fit for our work than for theirs. Two weeks later, Sonny joined our path. A month later, you call again, and another adult dog, the beautiful Lyons, joins us as well. Thank you for valuing our mission and choosing to partner with us. To our fosters. In the last year, 10 families have taken on the role of fostering dogs in their homes. The Trick family is here today, and they are fostering their second BluePath dog. You represent our local community that has stepped up in an incredible way. Thank you. To the families who have received these beautiful dogs. The road isn’t going to be easy, but then again, it never was. Sonny and Lyons have a big role in helping you move forward. Part of their job is easy - to bring more laughter. To bring your family together. Create joy. But the other part of the job is much more difficult. To provide safety so that your children may be better equipped to take more steps out in the world. To help your kids feel included in the world around them so that your family can better enjoy a soccer game, a restaurant, or a long, leisurely hike. Sonny and Lyons are ready. Sonny and Lyons will step in, and they will say, “hey, we got this.” And in time, you will realize that they do. To Haedyn and Zayna, you are two young kids who do not understand how unsafe you can be. Sonny and Lyons are here for you. They will dig deep and level the playing field for you. Together, with your dogs, the world will become safer and with safety comes opportunity, independence, and friendship. The dogs will share your anxiety, your fears, and probably some of your chicken nuggets. But they won’t leave you and they won’t judge you. Families, we are with you today. We are with you tomorrow. We are with you in the days and weeks and years ahead. When you signed on for a BluePath dog, you don’t just leave here with a dog, your family just got infinitely bigger and infinitely stronger and your hardships and your accomplishments will be shared by so many more shoulders. Today is a historic occasion and I am overwhelmingly honored to be here. BluePath has no limits - of that I am sure. Celebrating our first service dog teams! We recently celebrated the graduation of our first service dog teams! BluePath dogs Lyons and Sonny will make an exponential impact in their new homes. They will help children and their parents, support siblings and friends, and strengthen families’ connections with their communities. Safety, companionship and opportunities for independence… Lyons and Sonny will provide those precious gifts for their new families, and much, much more. To everyone who believes in BluePath’s mission and has joined us on the path – thank you. We are infinitely grateful for your support. Support BluePath throughout the holiday season! Our Online Store: Branded merch - clothing, water bottles, mugs and more! Shop BluePath. Amazon Smile: You shop, Amazon gives! Visit smile.amazon.com, choose BluePath as your charity of choice, and Amazon will donate .5% of every purchase to BluePath. Auburn Jewelry: Purchase “B spot” monogram necklaces, keychains, cuff links and rings. Choose from 18 different colors in either sterling silver or 14k gold. A portion of proceeds from the sales of all BluePath pendants will support our mission. Shop the Auburn collection here. BluePath Service Dogs is the proud recipient of a $10,000 grant from The Thomas and Agnes Carvel Foundation. In 1936, the late Thomas Carvel founded the soft serve ice cream brand, Carvel. Fueling a desire to make a positive difference in the world, Thomas and his wife, Agnes, created the Foundation in 1976. The Foundation devotes its resources to a variety of projects and programs, including ones that benefit children and individuals with disabilities. This grant will help us continue to train autism service dogs, offering safety, companionship and opportunities for independence. We are truly grateful for the Foundation’s continued support of our work. And the ring-bearer is.... BluePath Mikey! We arrived on Saturday ahead of time and gave Mikey a chance to just be a dog. We played fetch, tugged with a brand new toy, went for a walk where he sniffed to hearts content and said hello to dozens of visiting tourists. I waited until the very last minute to get him dressed and lined up for the procession. Walking down the aisle he was focused and relaxed. My gratitude and adoration for my 4-legged teammate pulsated down the leash with every ‘aw, how cute!’ from the wedding guests. The ceremony began with champagne toasts from the maid of honor and best man. Mikey’s ‘champagne’ was a chew toy stuffed with treats attached to a rope. Holding my champagne glass in one hand and hanging onto his toy with the other to prevent it from rolling out of his reach, he quietly paid no mind to the bugs. From left to right: Anne, Abby, Phil and of course, Mikey. Pictures followed, then inside for the reception. Mikey’s stamina was waning. He had a difficult time settling under the table. (NTS/NW, his endurance will get better as he gets older.) He was happy to jump into his crate in the car for a break during dinner. When the dancing started I brought him back in for his next training challenge. With dinner over it had become a different scene. He was completely at ease with the frenetic energy as we entered the room, but something else grabbed his attention. Popcorn and cake crumbs littered the floor. (NTS/NW, must practice dropping tidbits on the floor at home.) We moved beyond the food remnants and were swarmed as soon as we reached the dance floor. No worries, this is where Mikey excels. He looked at me for an ok to say hi and squirmed with joy as he greeted everyone. I handed his leash to the bride, then the best man, then one guest after another. Each of them took him across the room to a new cluster of partyers where they in-turn were swarmed and Mikey was amazing. What they saw was a super cute, well-mannered puppy they could play with in the middle of a wedding reception. What I saw was a puppy in training practicing his future job of drawing people to the person on the other end of his leash.